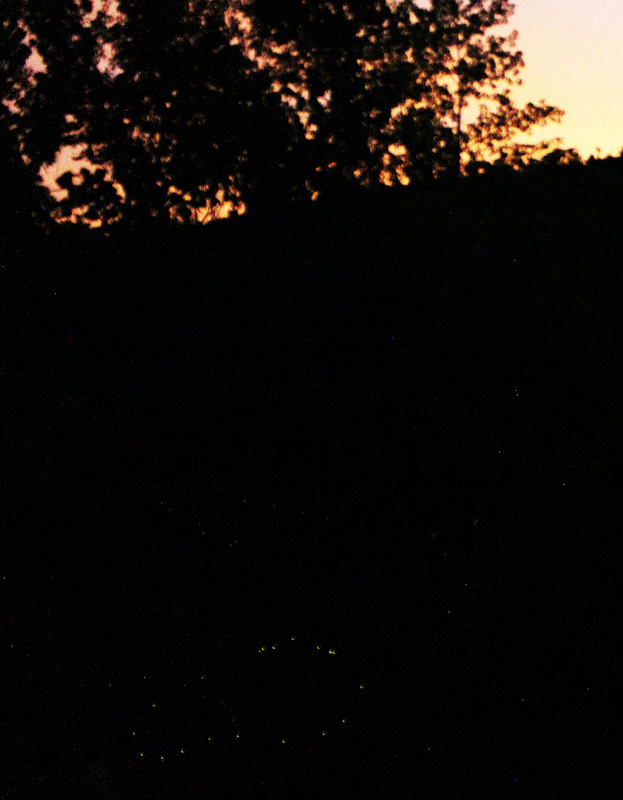 In this 32-second, 3200-ISO photo, a splay of fireflies reaches towards the last hues of the setting sun. Many evenings this summer, we have stood and looked down our back hill towards the little creek at the bottom. It has been alive with the sparks of fireflies. 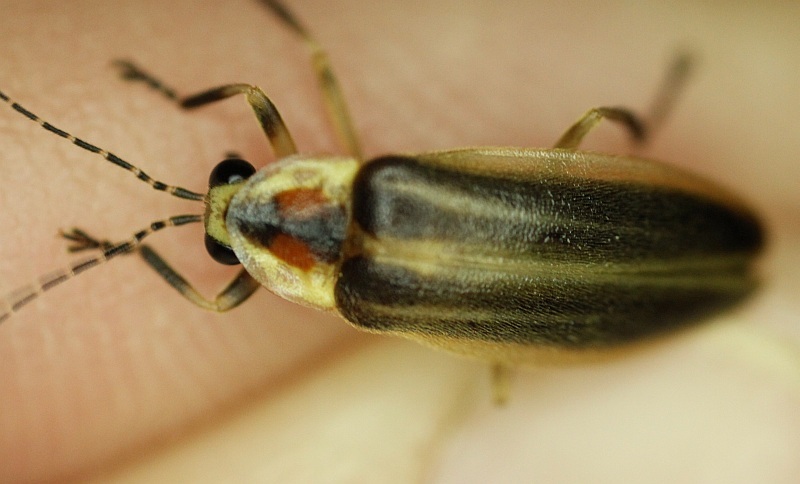 Fireflies aren’t flies (or phlies), they’re a family of beetles called, aptly enough, Lampyridae, and there are probably about 25 or so different kinds in our area. 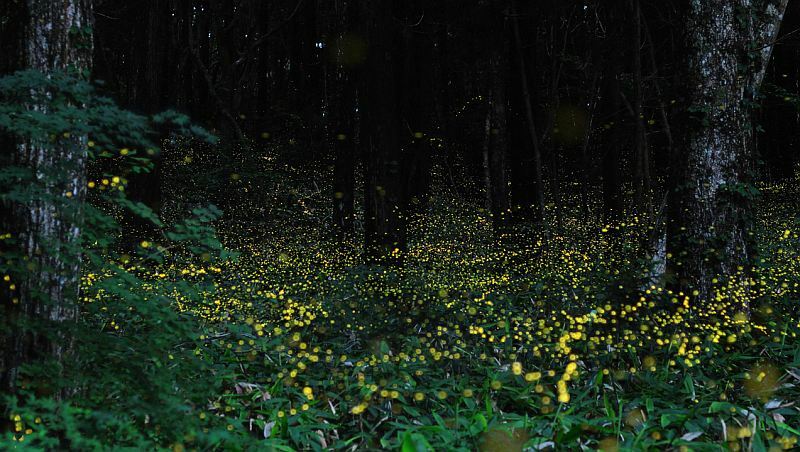 For all their renown, relatively little is known about fireflies. For example, in many cases, we’re not sure that adults even feed and, if they do, we don’t know upon what. We do know that one sly set of species imitates the flash patterns of other species and then devours the hapless suitor when it arrives looking for a mate. There is also very little information on firefly abundance over time. 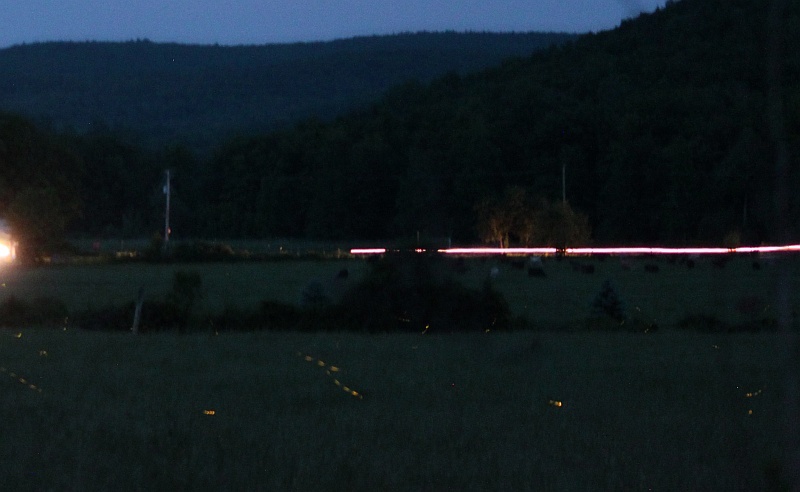 While there is a suspicion that fireflies have been decreasing, and the loss of the wetland habitats upon which many depend would be a convenient explanation, we really don’t have the good historical data we would need to mark trends. All known larvae are predaceous, feeding on worms, slugs or other soft-bodied organisms. This diet is probably responsible for the preference fireflies show for moister areas where such prey are most common. A single firefly apparently traced this ellipse as it circled. Was it a male homing in on a female? In most firefly species, at least the male flashes as he tries to attract a mate. The females usually reciprocate from the ground or from perches; some are even wingless. The flash characteristics (e.g., rapidity, number of flashes in ‘burst’, possibly color) are species-specific and can be used by members of the same species to identify partners and by biologist to ID species. 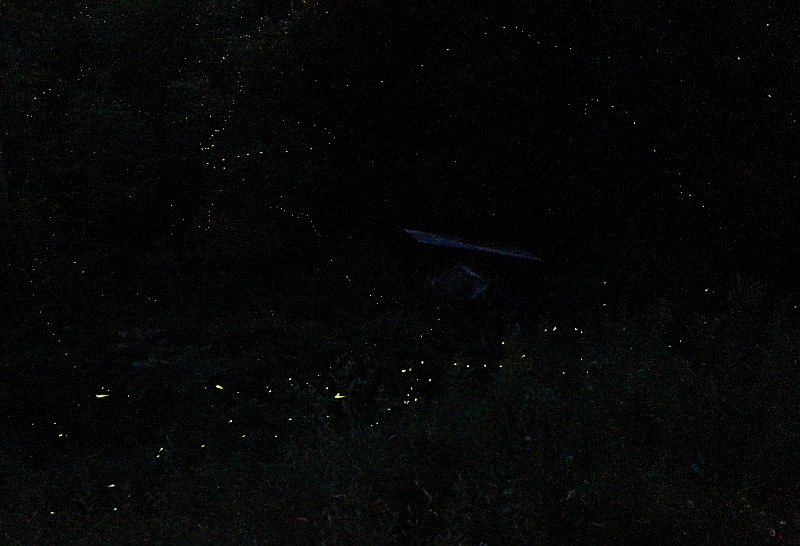 A few local firefly species are actually fireless and don’t flash. Interestingly, many larvae also are luminescent. Given that they are still ‘under age’, such pyrotechnics are probably not related to mating. The ‘dotted lines’ in this picture were formed as individual fireflies moved through the night during this half-minute exposure. 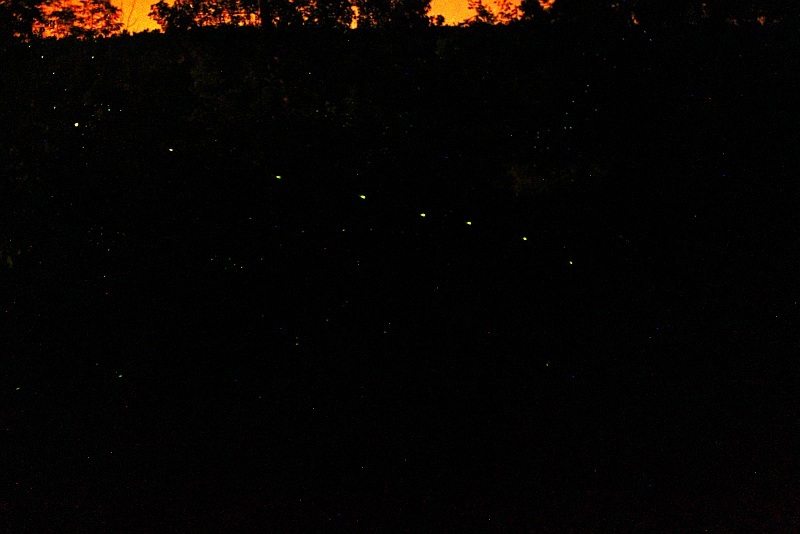 This is the same photo but here I have tried to trace the paths of some of the different fireflies. 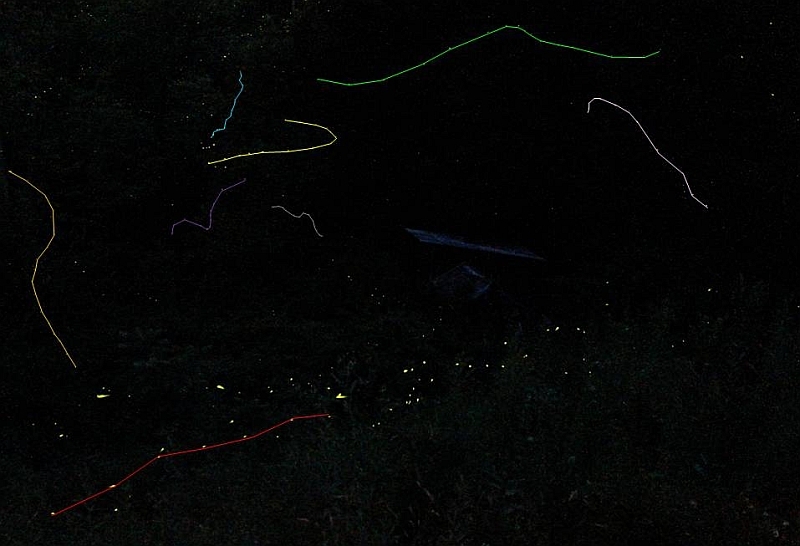 Firefly species apparently vary across the season and the hour. One might expect to see one (or more) species active shortly after sunset and other species flashing later in the night. Likewise, as the image below illustrates, there is a firefly phenology with different species flying during different months. The preceding photographs were taken from late June – early July, but the image above is from late May. 5-burst pulses of a slightly more amberish light. One would think that all this flashing would be asking for trouble. Why, for example, doesn’t somebody swoop down and pick off such easy prey? Apparently, many fireflies taste bad or are even toxic. In the same way that the Monarch’s bright colors advertise its milkweed-laced body, so too might the conspicuous flash of the firefly be one way of essentially saying, ‘Don’t waste your time; I’m a bad meal’. 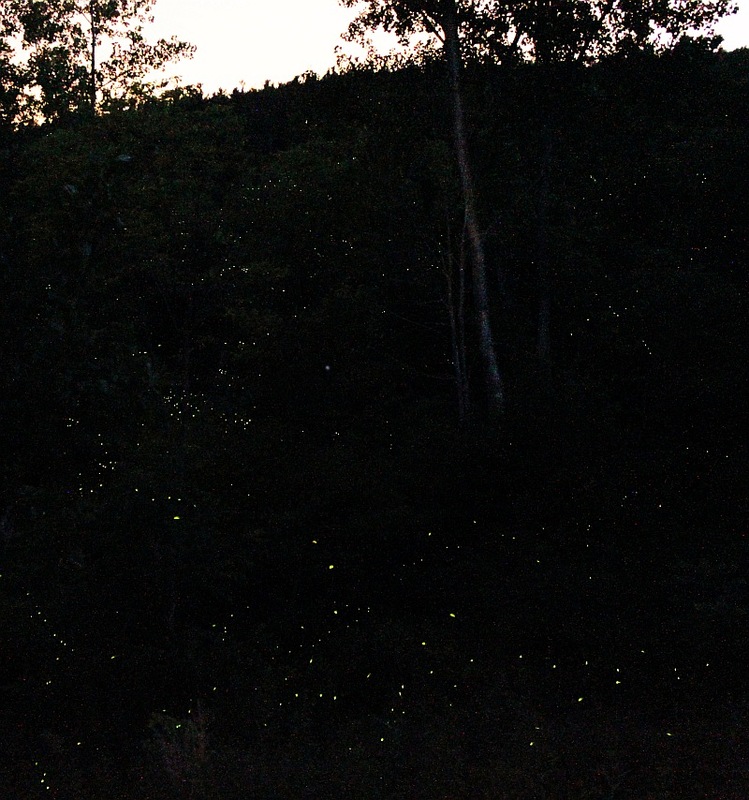 It has been proposed that this auxiliary raison d’etre for flashing explains why firefly larvae also glow. Photographers much more adept than me have done long exposures of fireflies and have produced some stunning shots. at some little crum creek and Nature Posts. So last but not least, the biological reason for some of this photographic snooping was to see if I could ID species from such exposures. After all, if color, timing and pattern are characteristic, then such photos should be diagnostic. So I referred to the handy-dandy flash chart assembled by the Boston Museum of Science’s Firefly Watch (there is much other interesting info. at the project’s web pages). Careful, complex mathematical calculations (such as, 30 divided by 15) resulted in a pulse rate estimate for our June/July flyers of about 1 pulse every 2 seconds. Consulting the charts suggests a species such as Photinus collustrans or Photinus scintillans. Given that the only records I could find for the former are from Florida while the latter is at least rumored to get as far north as Canada, I supposed that I had spotted P. scintillans. To confirm that confident conjecture, I studied a specimen which I snagged off of a leaf by our flashing yard…. My catch: Photirus, a firefly which uses its flash not only to attract mates for itself, but also to lure other mate-seeking species in for dinner. Errr… this is clearly not a Photinus species. Instead, it is a species of Photirus, a genus of firefly whose members will mimic a wide array of flash patterns in order to attract a meal. So, either all those flashers are Photirus out there imitating each other or my mystery remains unresolved. Somebody trying to make a phool of me?